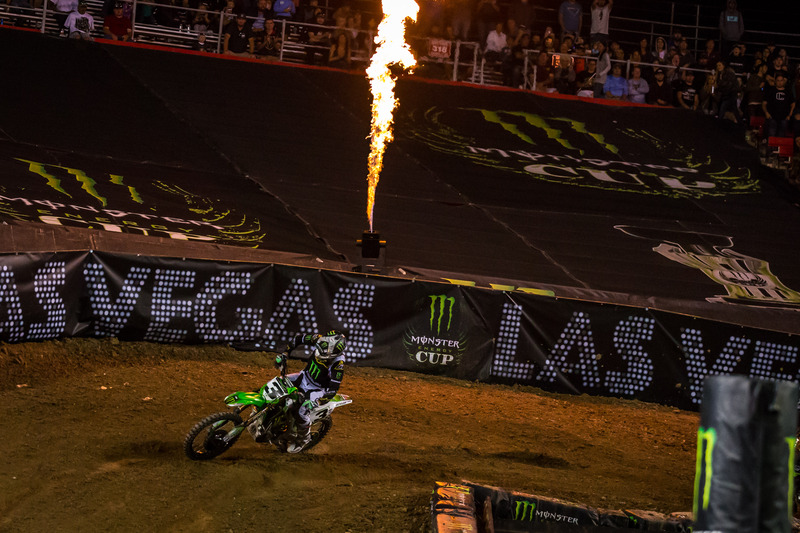 Tomac and Hebert Double Down in Las Vegas! The eighth running of the Monster Energy Cup ended up being the biggest pay day of Eli Tomac’s career and the stuff of dreams for super-fan Jesse Hebert. 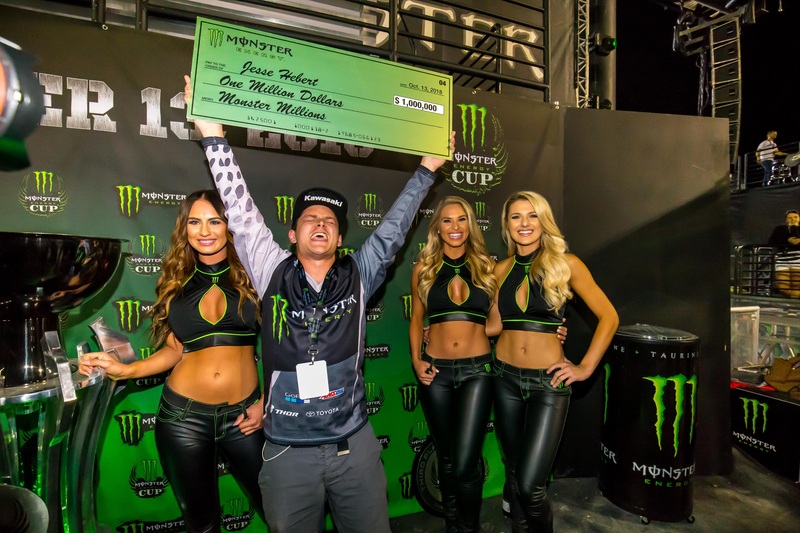 While Tomac blistered the field to win three straight Main Events, Hebert was one of 10 lucky contestants in the “Monster Millions” campaign who were placed in a competition before the race in money machines to see who could grab the most cash in a minute. Hebert, from Maryland, grabbed $406 and won the challenge placing him in the driver’s seat to win $1 million if a racer captured it on the track. As Tomac charged from a 7th place start in the final main event, the cameras were on both the action on the track and Hebert who was completely on edge with the prospect of $1 million heading his way. The capacity crowd was on their feet screaming as Tomac took the lead and in one fell swoop, $2 million dollars was awarded! It was one of the most electric moments in Supercross history. 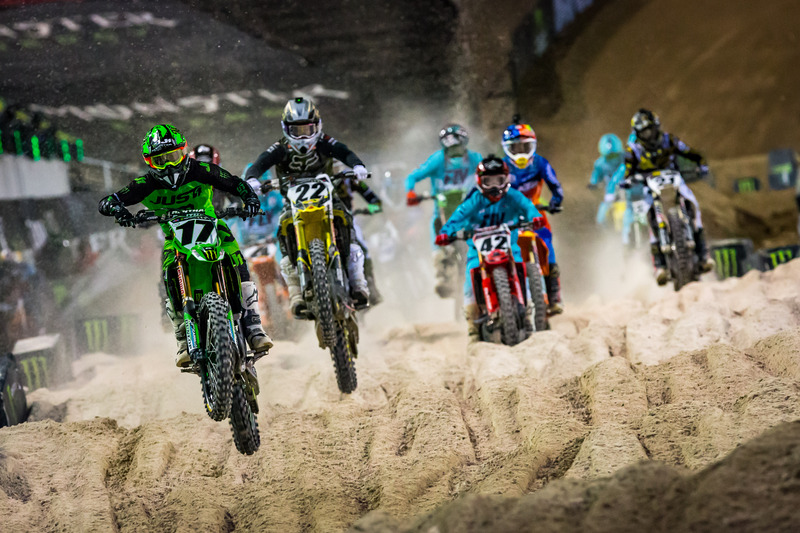 There was a lot of hype heading into the event, with four-time Monster Energy Supercross Champion Ryan Villopoto coming out of retirement to race. Villopoto won the $1 million at the inaugural Monster Energy Cup in 2011 but hadn’t raced a major Supercross event since the 2014 season. How would “RV2” fair against the current cream of the crop? Another exciting addition was the entry of two-time Monster Energy Supercross Champion Chad Reed on a factory JGR Suzuki. Other major pre-race chatter centered around the possibility of 2017 $1 million winner Marvin Musquin going for a repeat, and if his rivalry with Eli Tomac would continue to materialize. Throw in 2018 Monster Energy Supercross Champion Jason Anderson, 2012 Monster Energy Cup Champion Justin Barcia and new rookie Joey Savatgy and the stage was set for an unforgettable night of racing! The day began with the Monster Energy Pit Party going off with high energy elements like Dirt Shark Biggest Whip Contest and Brian Deegan launching his off-road truck off a 120-foot ramp to dirt gap. 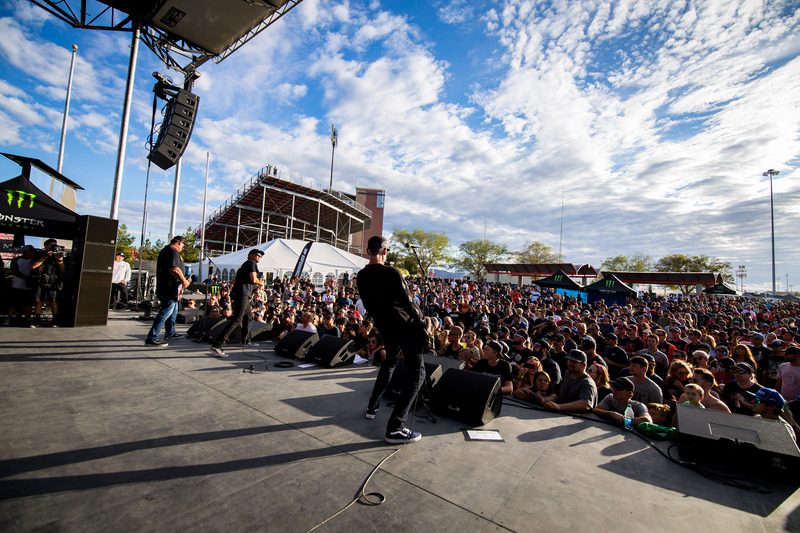 Legendary punk rock band Pennywise ripped up their stage and had the thousands in attendance hyped to the moon for the night of racing. 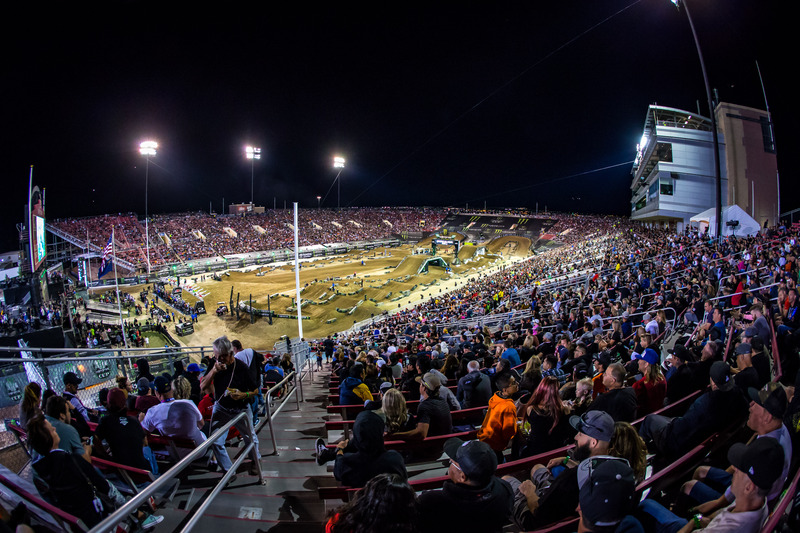 After some state-of-the-art opening ceremonies rocked Sam Boyd Stadium, the first Main Event fired off the line. The race was all Tomac as he took the checkered flag with a huge lead over Musquin. This set the tone that he was going to be a force for the million and others had to step it up if they were to stop him. Main Event two saw Musquin suffer misfortune and would finish 9th. Meanwhile it was Tomac who to a convincing win for the second time setting the table for himself, and Jesse Hebert to each capture $1 million! This scenario created a buzz in the stadium that was so intense that the hair on your arms stood up and you just had to think to yourself, “In 10 laps, two people could win a $1 million!” It was a vibe and a fever pitch that has maybe never been reached in Supercross history. As history would have it, the remaining 10 laps would be barn burners. With the crowd on their feet the gates slammed down and all eyes were on Tomac. He would round the first corner in 7th place while his rookie teammate Savatgy, pulled the holeshot and set sail. Tomac was so far back. He couldn’t do it…or could he? With the laps clicking off by the minute, Tomac went on the charge that became an inferno of determination. He was up to 5th, then 3rd and as the white flag flew the No. 3 Kawasaki was in 2nd position and pouring the coals into his machine. Meanwhile, Jesse Hebert’s heart rate hit an absolute spike and with the crowd screaming their lungs out, Tomac took the lead with two corners to go! He did it. As the checkered flag flew it was almost surreal what had just transpired. Two men had just won $1 million bucks a piece in one night. Tomac’s charge in the third Main Event was the stuff of legend. And Jesse Hebert had the night of his dreams. The 2018 Monster Energy Cup will go down in history as perhaps the biggest night of all-time in Monster Energy Supercross.